Campo Verde High School in Arizona raised $15,000 in one year for their basketball team using Sideline Interactive’s digital scorer’s table and fundraising methods. They kept 100% of the fundraising. 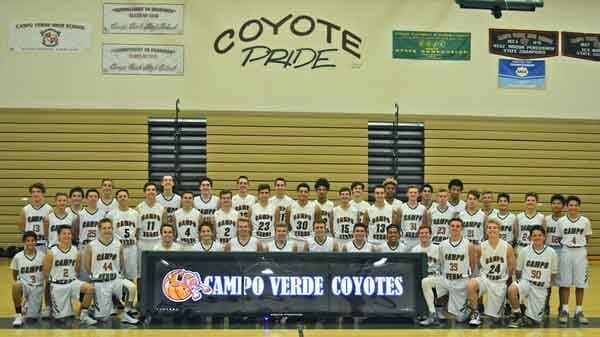 Below is an interview with Vicki McLay, booster club president, and proud parent of an athlete on the Campo Verde basketball team. 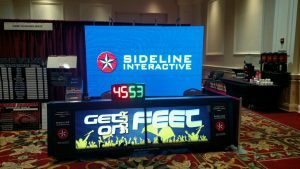 She shares with us her fundraising methods and how her team raised $15,000 with Sideline Interactive scorers table. 1. What fundraising have you done in the past? How did they work out? Previous years we have held a golf tournament, a fundraiser at a steak house. Both raised about $3,000 but the golf tournament was so much work and not worth repeating. We have had business sponsorships prior years and the companies’ logos would be shown but there was no follow through with previous booster club officers. So the promised logo advertisement scrolling on a tv in the lobby was inconsistent. So the concept for us was really natural since we kind of already had things set up similarly. Basically a parent would plug in a thumb drive to a tv in our lobby and it scrolled the logos. Overall, our past fundraisers didn’t work out nor make us much money given how much effort we put in. 2. How easy/hard has it been to get fundraising using the digital scorer’s table? It was very easy. It sells itself. We had one parent in particular that is an oral surgeon and had connections with a few doctors and dentists. We feel like this coming up season we will have more time to prepare and get more sponsors in our preseason time. 3. What has been your results? We were able to raise about $15,000 this year with finding about 15 different sponsors at varying levels this year that wanted their logo on our scorers tale. 4. How easy/hard has it been to put the digital ads into the scorer’s table? It was fairly easy. A lot of the sponsors do not give the correct size, so we have to do some adjusting. 5. How much involvement do you get from parents/students/coaches? We have a great supportive community. Most of our parents want to help and contribute at the level they feel comfortable. We often do have the same 10 people that we can rely on to do anything though. Our coaching staff was very hands on with the table and our head coach learned as much or more about the table/laptop, and how to run it, as I did this year. We had a media student volunteer donate several hours to put together player prompt videos for our varsity team after our coach did the actual videos of the players. This was very exciting for all the players to see themselves on the screen and added a fun element to our games. We are trying to increase our student attendance at our games and the digital table helped to do that. 6. What advice would you have for any school wanting to invest in a digital scorers table or create a fundraising program? I would say to put together a package showing what the scorer’s table is and can do to present to the sponsor. Offer different sponsor levels but keep the amount high. Our average sponsor gave $1,000 but we go up to $3,000. We want to keep the amount high and limit the amount of sponsors so the demand stays high. 7. Do most sponsors come back year after year or do you have to actively pursue them every year for donations? We will see. This is our first year but we think most will come back. We made sure to make thank you plaques with pictures of our teams standing next to the score table with their business logo on it. We plan to work during the off season to be more prepared next season and have our sponsors lined up. We are also trying to get a few more sponsors like high end car dealers. We need to put together a “marketing package” to show the sponsor all the things the table can do. Besides showing a video of the actual scoring table, we want to have pictures in a presentation binder to take around. I am the Booster Club President serving a term for 3 years. I ran the table this year at every game. We used it for freshman, JV and Varsity. Next year I plan to have a few parent volunteers and rotate a schedule. I had only one parent help this year but I felt I was just trying to learn it and wanted to experience it all before being able to train and prepare a few parents that are interested in helping with it. 9. What are the critical roles or responsibilities to ensure the success of fundraising? Of running the digital scorer’s table? My main goal was to follow through with the promises we made to our sponsors as far as their logo being seen on the score table. We have different level sponsorships so some are announced as a commercial during halftime and others are 3 point sponsor and so forth. We wanted to make sure we delivered, and feel the success of the score table is only as good as the sponsors satisfaction. We had positive feedback and very happy sponsors this year. As far as running the scores table, I feel like going into next season, we will be more organized and prepared for the season to begin. It was a learning curve year for all of us since it was our first year. I enjoyed running the digital score table. What’s nice about the score table is at the minimum you can push play and walk away and no one has to “man it” per say. The logos can just run through. I am kind of a perfectionist with it and wanted to use it in its “full glory” so I made sure to run all the prompts during the game. Running the score table can be as busy or laid back as you want it to be. In my opinion, it’s like a swiss army knife. There are many tools at my disposal. Some of them used more often than others but why not use all the tools and have the score table at it’s full potential?! I feel training other parents to learn how to run the score table is important and something I plan to do more of this next season. That way it’s not dependent on one person. We are very happy with the digital score table. Many schools came in and admired it along with the game officials. 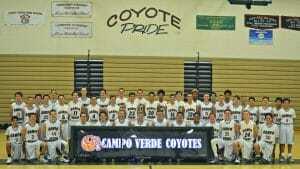 CONGRATULATIONS TO THE CAMPO VERDE BASKETBALL TEAM FOR A GREAT SEASON!